We're excited to announce our latest round of fundraising! 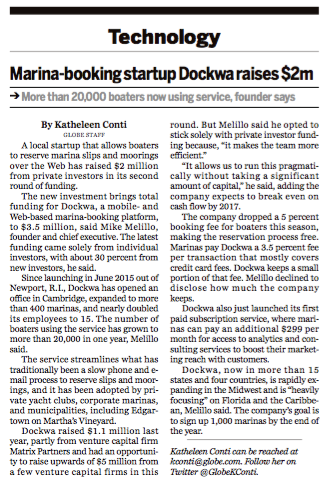 In just one year since our last round of funding, we launched our free iPhone and Android apps, grew from just a handful of marinas to more than 400, doubled the size of our crew, and now have more than 20,000 boaters on board. We couldn't have done it without you! Thank you to all of our boaters, marina managers, and supporters. If you've used the Dockwa app or website, there's a chance you may have downloaded the app, surfed to see which marinas are on board, and started booking – which is fantastic! But if you're now looking for a little more context about our recent news and what's to come, you've come to the right blog post. Often referred to as the "OpenTable for Boating," Dockwa has created a seamless reservation platform through which boaters can communicate directly with marinas, yacht clubs, and shipyards. We connect boaters to marinas in real time, allowing them to explore, reserve, and securely pay for a slip or mooring via the platform. Since launching in May 2015, Dockwa remains the only service of its kind to offer both a unified booking and marketing platform for marinas. In layman's terms: We're not a concierge service. When you book using Dockwa, you're "speaking" directly to the marina via the app, with no middle man, and answers and information come back directly to you via the app as well. No calls, no paperwork, quicker confirmations. The service streamlines what has traditionally been a slow phone and e-mail process to reserve slips and moorings, and it has been adopted by private yacht clubs, corporate marinas, and municipalities, including Edgartown on Martha’s Vineyard. Click here to read the full Boston Globe article. We're particularly excited for what this means for our upcoming boater features. As our CEO Mike Melillo said, "While the early traction is exciting, over the next twelve months boaters and marinas will be exposed to features that have previously not existed in the space before." Beyond features, this new momentum is also already propelling us to bring on more marinas in a larger footprint. This summer we expanded to the Midwest, one of the largest and most coveted boating communities in the country, with the addition of 13 locations in Chicago Harbor to the network. Dockwa, now in more than 22 states and four countries, is rapidly expanding in the Midwest and is heavily focusing on Florida and the Caribbean, Melillo said. The company’s goal is to sign up 1,000 marinas by the end of the year. Thank you again for using Dockwa. Happy boating!